If you are looking for a drug abuse treatment program for yourself or for a loved one, it can be a bewildering process to distinguish between all the different choices that are out there. When every program claims to be the best drug rehab center or have the most effective recovery model, how do you sort through all the clutter to find what will truly be the best fit for you? The first thing that you should do is to sit down and think about your goals, your “why” for attending rehab in the first place. Do you know your own reasons for enrolling in treatment? Do you have a clear picture of the endgame, the outcomes that you want? Knowing this can help you to narrow down your choices once you get the answers to the questions you’ve asked. Here are some questions we’d suggest that you ask when you are choosing a treatment provider. Remember, the rehab program will be asking you a bunch of questions as part of your application process. However, the fact that you’re entering rehab affects your life, too, so don’t feel like you’re out of place to be interviewing them. 1. What is your overall treatment approach? Asking this question will give you a lot of insight into the kind of things that your rehab program will focus on during your time in treatment. You’ll quickly find that there is a wide range of treatment philosophies out there. Does the center primarily rely on weaning you off of drugs through the use of other drugs? Do they have a proprietary curriculum or unique model of how their treatment works? What emphasis do they place on using a 12-step program? There is a lot of insight that you can gain by asking about the overall treatment approach. Eternal Awakenings uses a mixed approach that combines medical science and Christian faith. 2. Do you believe that an addict can recover completely from an addiction? Not every drug or alcohol treatment facility believes that you can actually be free from your addiction. “Once an addict, always an addict” is a common theme you’ll hear in many recovery centers across the nation. It’s understandable why people believe this, because after all, addiction is extremely difficult to conquer. Only a select few programs actually believe that an addict is not doomed to merely be a “recovering addict” for the rest of their lives. These programs believe this because they have seen it. There is a greater level of recovery that leaves you truly free, and you should look for a program that has this philosophy. Eternal Awakenings believes that true freedom from any addiction can be found in Christ alone. Even if you’re not a believer, we would recommend that you investigate how a Christian treatment center can offer you the type of counseling that will bring you the lasting sobriety that you are longing for. 3. What is the success rate of your program? Addiction is hard to conquer, and there’s no rehab facility that has a 100% success rate, so you shouldn’t expect that. However, what you should expect is that the facility can tell you an approximate number or percentage of the results that their graduates have experienced. Be wary of a program that can’t provide you this information or gives you a vague runaround in answering this question. You want to enroll in a rehab program that works. At Eternal Awakenings, 90% of our graduates remain drug and alcohol free two years later. 4. What kinds of activities will happen in a typical week? Not every drug abuse treatment program is the same, and some offer a lot more amenities than others. There are some that have so many restrictions that you might feel like you’re in jail. There are others that have a ton of fun and cool-sounding activities that are great, but that don’t contribute anything towards your successful recovery. You want to look for a program that has a very strategic schedule that they’ve created to maximize the use of the time you’re spending in treatment. After all, you’re coming to treatment not to be entertained, but to be built strong so that you can go on with your life and stay sober long-term. Eternal Awakenings offers you a mixture of activities, and we make it a priority to make the whole program feel as close to “real life” as possible, with outings to town and family visits encouraged rather than restricted. Here’s where you can view our typical weekly schedule. 5. How many people will I be interacting with on a day-to-day basis? Depending on whether you’re a people person or an introvert, this can be an important thing to know. How many counselors or leaders will you have? How many other patients will you be running into? It’s no secret that your interaction with these people can make or break your ability to successfully graduate. We strive to make our interactions as natural and human as possible. When you enroll in our program, you’ll have the benefit of a small, intimate group setting that gives a good balance of time to be alone and time to be with others. Watch our video to get a glimpse of the positive, nurturing environment we’ve created here at EA. 6. What are the living quarters like? Again, there is a big range of the quality and type of accommodations that you’ll have as part of your on-site addiction rehab program. Some places might have bedrooms that look like dorms, with bare-bones necessities and cinder block walls. Others might have a little bigger budget but you still feel like you’re in an institution, or they might have a format with individual cabins or housing units. Whatever the layout, you should have the chance to see photos of the place you’ll be living. You should also be able to get the answers to questions like whether you’ll have roommates, and how many, or whether you’ll have to share a bathroom with others. Eternal Awakenings is fortunate to operate in a beautiful, historic Texas mansion, where you’ll feel like it’s more of a home than an institution. View photos of our facility. 7. What sets you apart from other programs? When you ask this question, listen for whether the person can articulate a clear answer back to you. If they beat around the bush with vague, non-concrete answers, you might just conclude that their program is “same-old, same-old” and keep looking. On the other hand, if they have a clear and compelling answer, but it doesn’t resonate with you, you might still want to keep looking. Your drug abuse treatment should be something that you can fully believe in and get on board with. Here are some of the things that set us apart here at EA: We highly value the inherent dignity and autonomy of each guest. We strive to embrace your dignity and express that value to you by our actions. For example, we promote communication with your family via phone and visits with family without constraints. This is a rare thing as most programs have a restricted window for family visits. We encourage you to have a “real world” experience in our program as soon as possible, usually in the first three days. For example, a guest may go shopping along with a senior resident. You can also leave campus any time so that you know your sobriety while you’re here is real. 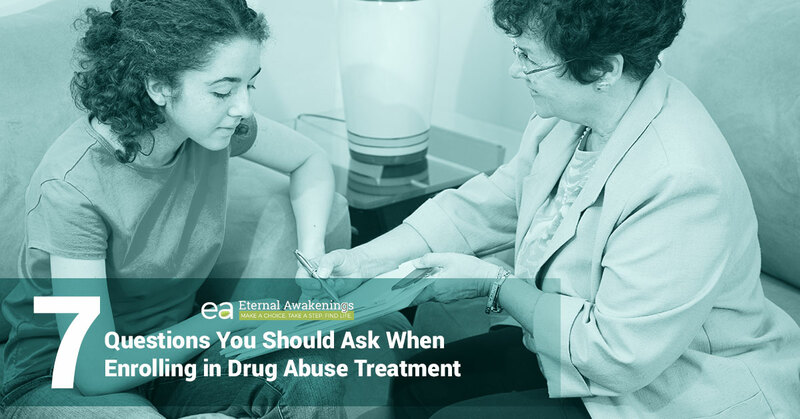 Eternal Awakenings is here to provide addiction recovery counseling for any drug or alcohol addiction. Our program is open to men and women, and people from all over the nation have found lasting sobriety, healing for their past hurts, and hope for the future through our rehab. Find out more and get started with the enrollment process when you contact us today.